A team of Japanese researchers from Waseda University, Osaka University, and Shizuoka University designed and successfully developed a high-power, silicon-nanowire thermoelectric generator which, at a thermal difference of only 5 degrees C, could drive various IoT devices autonomously in the near future. Objects in our daily lives, such as speakers, refrigerators, and even cars, are becoming "smarter" day by day as they connect to the internet and exchange data, creating the Internet of Things (IoT), a network among the objects themselves. Toward an IoT-based society, a miniaturized thermoelectric generator is anticipated to charge these objects, especially for those that are portable and wearable. 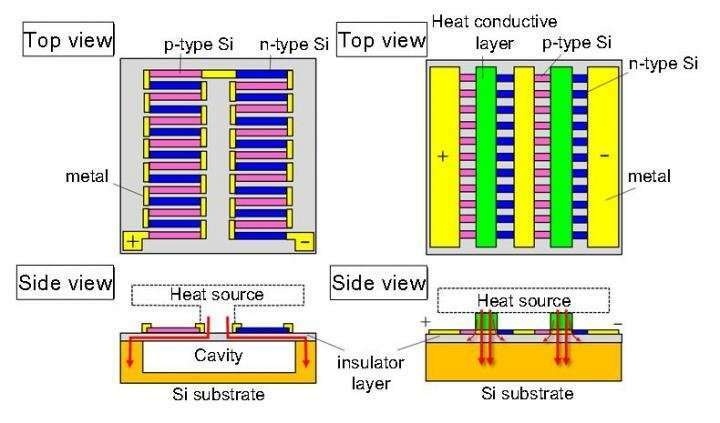 To address these problems, a team of Japanese researchers from Waseda University, Osaka University, and Shizuoka University designed and successfully developed a novel silicon-nanowire thermoelectric generator, which experimentally demonstrated a high power density of 12 microwatts per 1 cm2, enough to drive sensors or realize intermittent wireless communication, at a small thermal difference of only . The newly developed thermoelectric generator lost the cavity structure but instead shortened the silicon nanowires to 0.25 nanometers, since simulations showed that the thermoelectric performance improved by minimizing the device. Professor Watanabe explains that despite its new structure, the new thermoelectric generator demonstrated the same power density as the conventional devices. More surprisingly, thermal resistance was suppressed, and the power density multiplied by ten times by thinning the generator's silicon substrate from the conventional 750 nanometers to 50 nanometers with backside grinding.